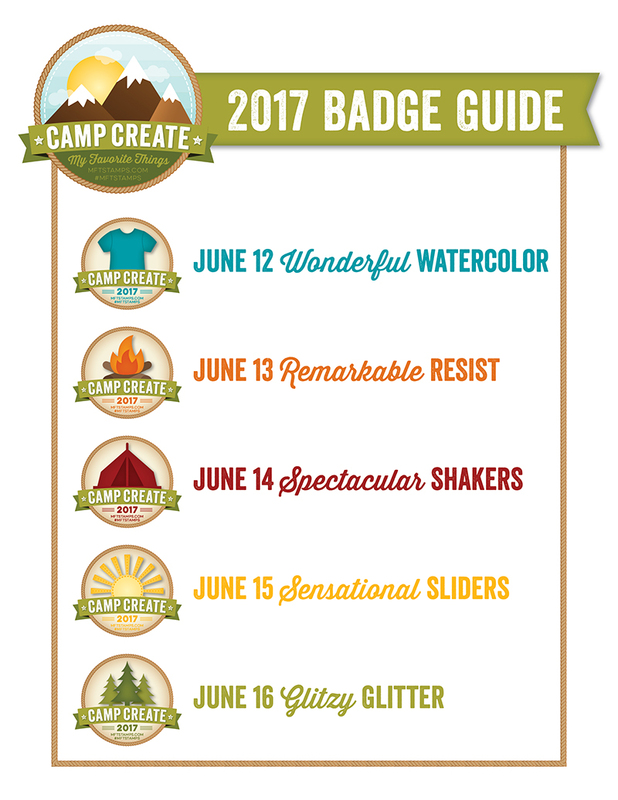 After spending a few weeks out of town I finally got the chance to create with the June Hero Arts Card Kit. This kit is my favorite kit from Hero Arts. 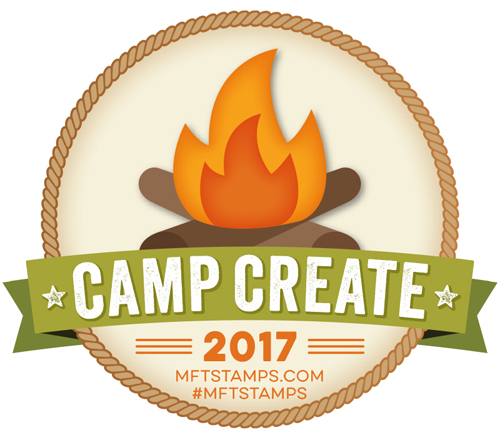 I loved the colors, size and variety of the stamps. 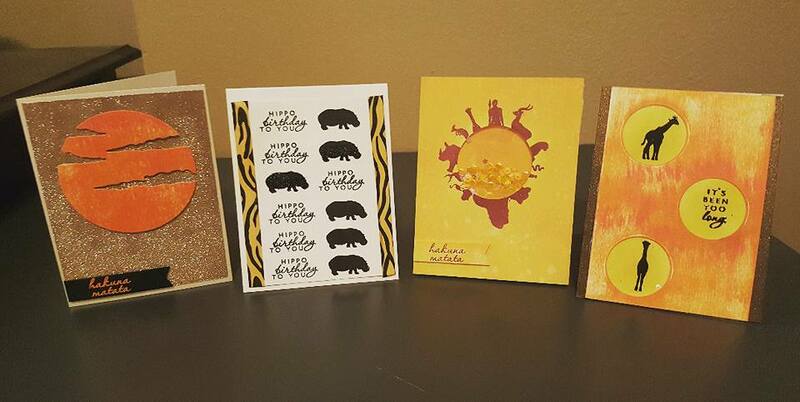 I created four cards using this kit, using glitter, embossing and also acetate that I embossed on. So much fun creating these cards. I hope you enjoy! Don't forget to subscribe to my YouTube channel if you want to have notification of future video's. As always your comments are always welcome!! 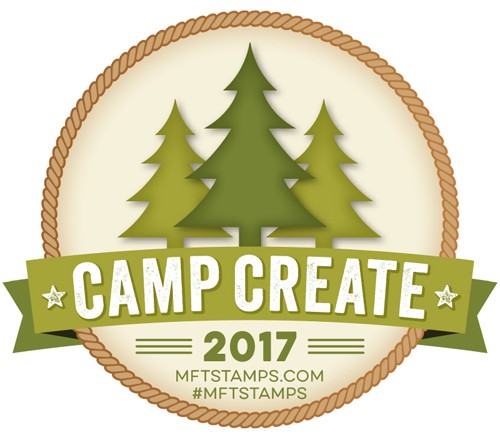 This is the final day of MFT Camp Create. It has been a lot of fun creating using different styles and themes. I have also learned new techniques along the way from the video's on the MFT Blog. 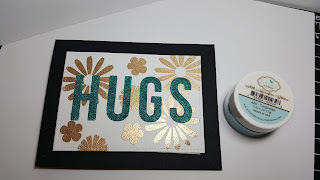 For the last day Glitzy Glitter I decided to create a simple card using the MFT Big Hugs Die and MFT Large Desert Bouquet along with Elizabeth Craft Designs Turquoise Glitter and Ranger Gold Embossing Powder. 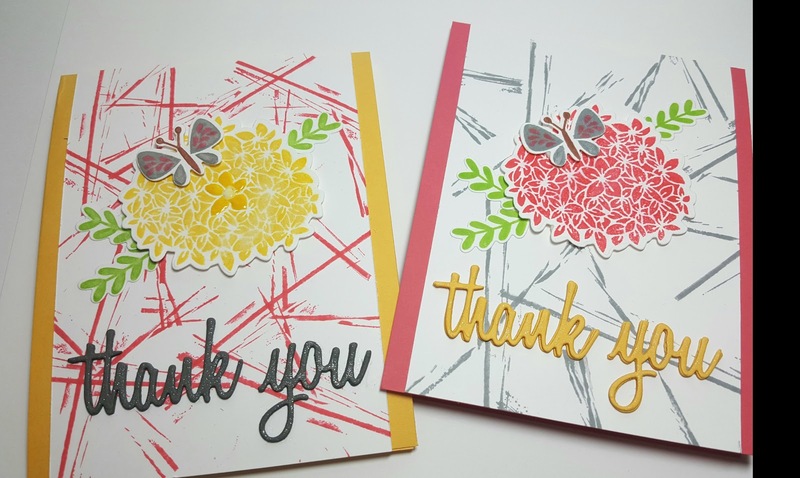 First, I stamped three of the flowers from the stamp set with Versamark embossing ink after using my EK Success Powder Tool to keep the embossing powder only on the image that I want to emboss. Second, I adhered my panel, which is Neenah 80 lb to an A2 card base. 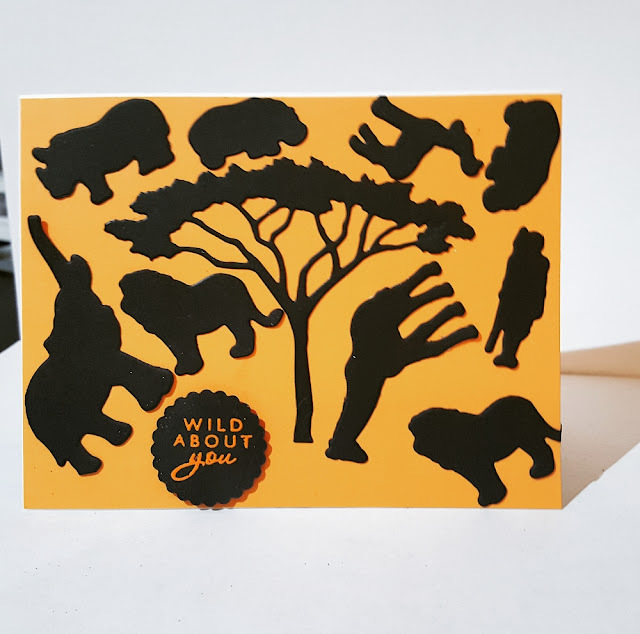 The base I used in the video is Neenah 110 lb, however after the video I decided that I wanted the base to be black so I used Lawn Fawn Black Licorice Cardstock cut to A2 size for the final card. 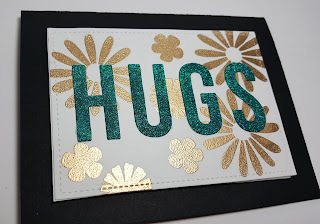 To create the glitter letters I adhered three rows of 1" Scor Tape to the bottom of a piece of Neenah 80 lb. Once the three rows were adhered I ran the Hugs die on the scor-tape through my Big Shot several times to cut though the cardstock and scor-tape. Once the letters were cut I simply removed the scor-tape and spooned the glitter on to each letter. 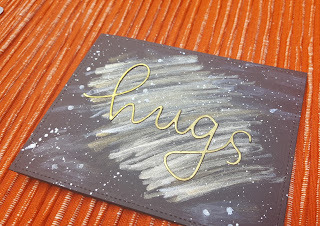 After each letter was covered in glitter I used my finger to push the glitter into the tape then I used my bone folder to further burnish the glitter. Tip: Use a swiffer cloth to clean up the glitter and remove the excess. It will keep the glitter from coming off. Last, I adhered the letters to my panel to complete the card. 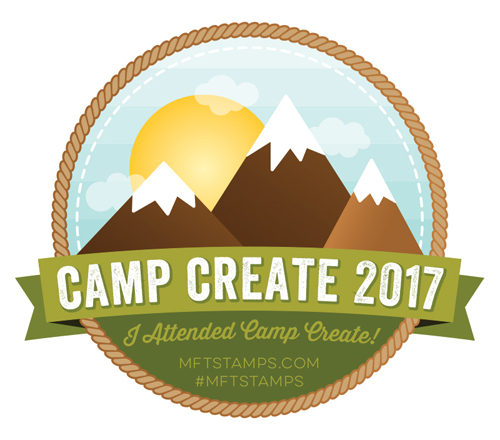 I have really enjoyed the MFT camp create and I hope you have as well. 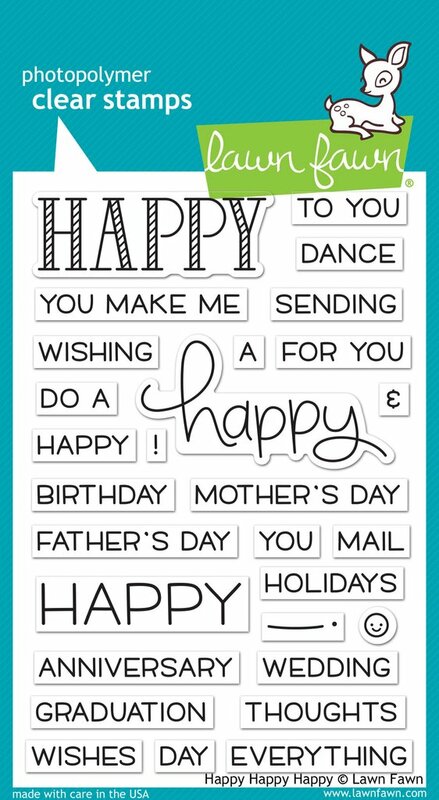 Click Here to view all of the cards that I have created during the week. I received My Monthly Hero Kit June 2017 today and I cannot be more excited!!! I LOVE, LOVE, LOVE this kit!! 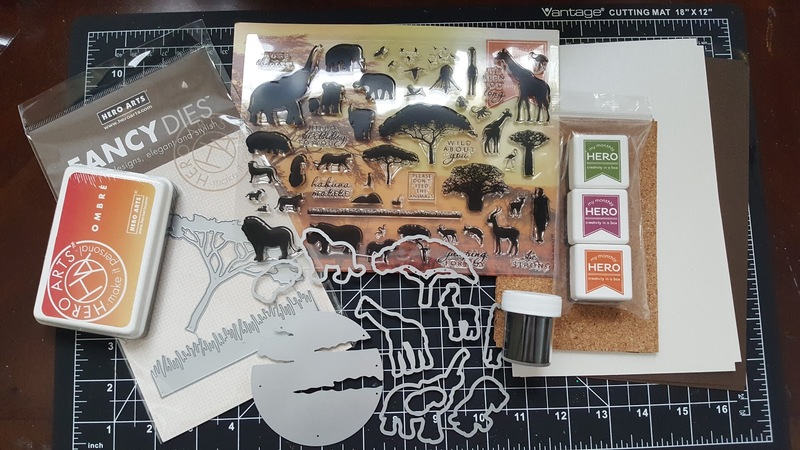 View the unboxing video to see the contents of the kit along with two ad-ons that I purchased. 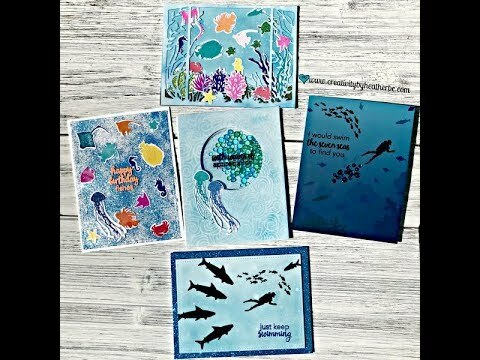 Be sure to check back and see the fun I create with 5 Cards 1 Kit coming soon! This paste is so much fun to work with. It goes on smooth and after it dries it does not flake like some glitter paste tend to. The sugar paste is fun because you can add any color ink to it and create your own custom color. I have attached a video using the paste below. 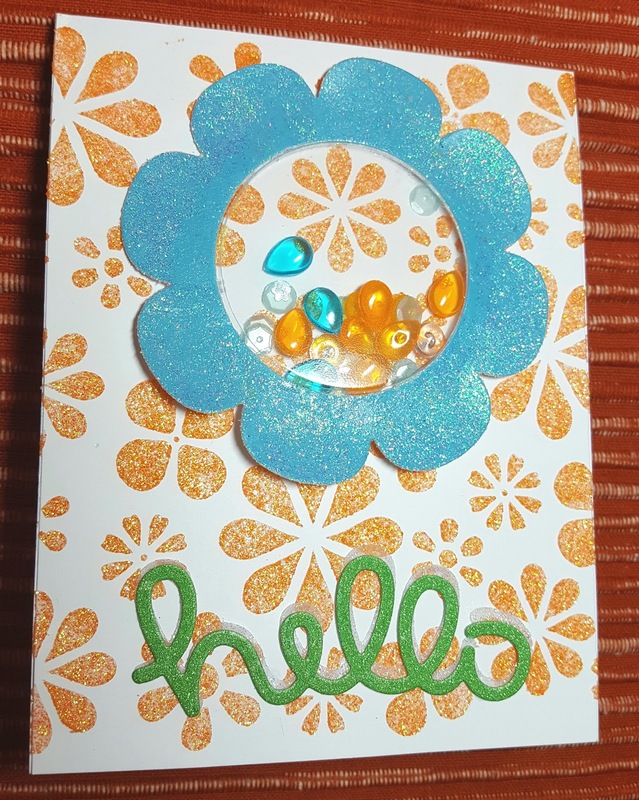 I decided to make a shaker card using the My Favorite Things Shaker Flower Die-Namics along with the MFT Circle Shaker Pouches. The pouches make creating a shaker card so easy. 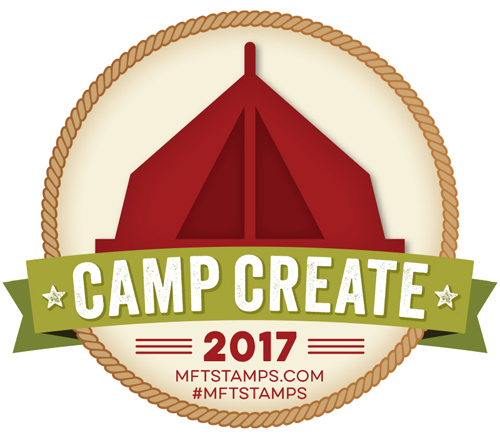 MFT designs them so they fit with their circle dies and shaker die-namics. After cutting the flower out of Hero Arts Cerulean card stock. I coated the flower with the Bo Bunny sugar glitter paste using a craft sponge. I applied a very light layer so it would not saturate through the card stock and warp the paper. For the sequence inside of the shaker I used Honey Bee Stamps Florida Dew Drops. I love these drops! They measure between 3mm to 5 mm in Florida blue and orange along with clear. They are gorgeous! Once I had the dew drops placed where I wanted them I adhered the shaker pouch over them and added the flower. For the sentiment I choose to use the Lawn Fawn Hello die, which I cut out of green glitter card stock that I had in my stash. 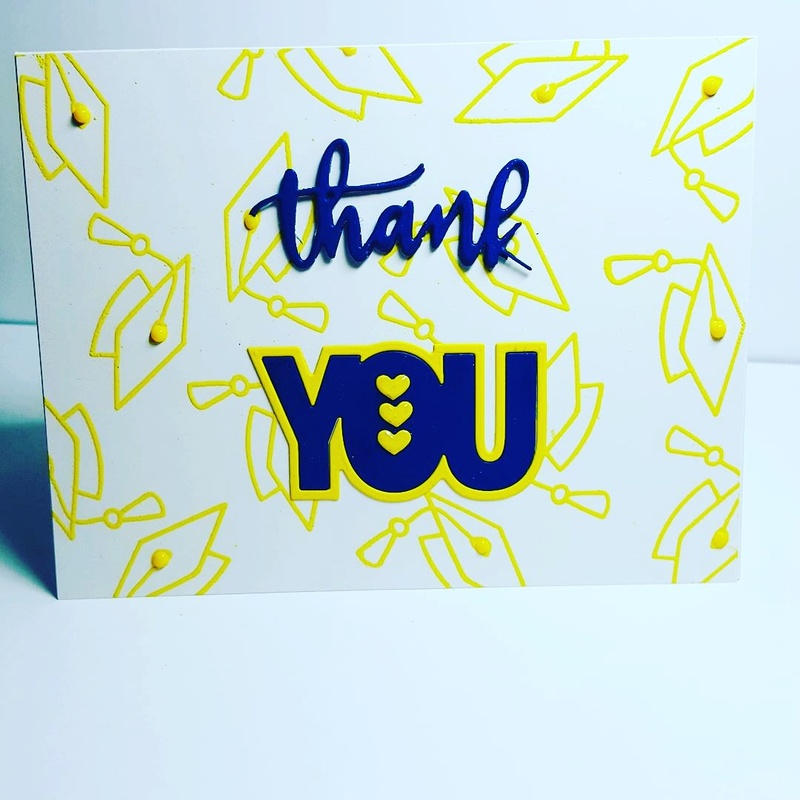 I adhered it down with glossy accents and the card was complete. 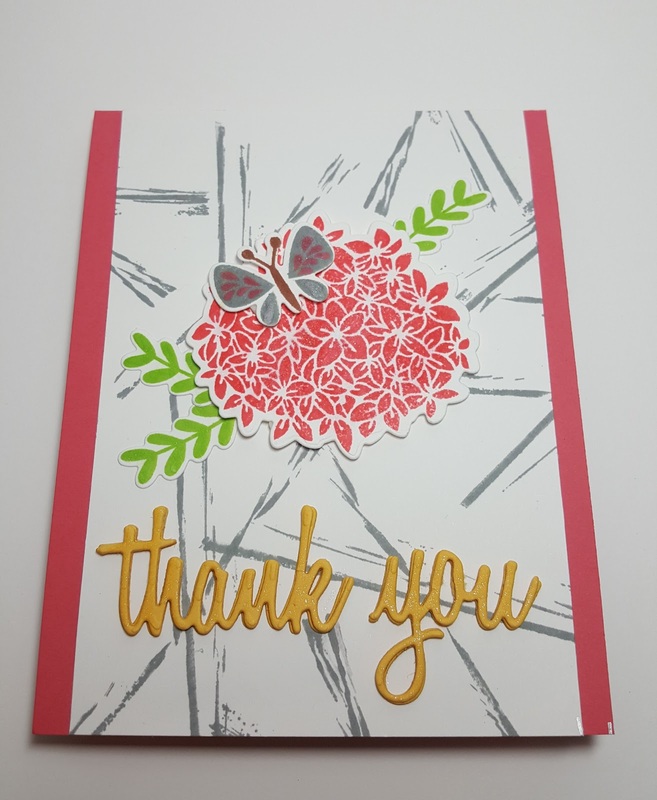 Very simple textured shaker card that will brighten anyone's day! Check out the video linked below using Bo Bunny glitter paste and don't forget to subscribe to my YouTube channel. 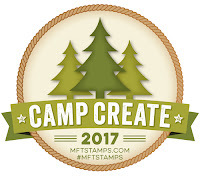 My Favorite Things Stamps is holding a week long Camp Create on their blog. 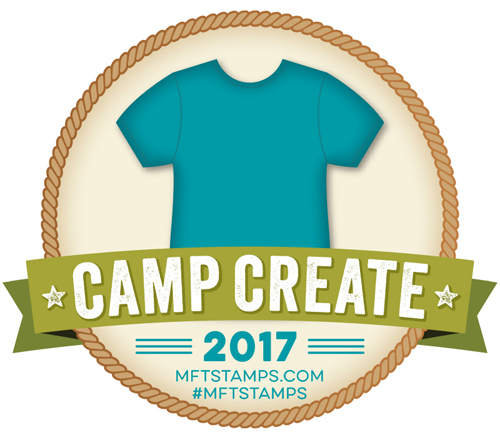 MFT designs unique and fun stamps and dies. 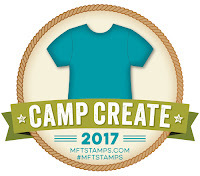 Each day starting yesterday, Monday June 12, 2017, MFT will post a new challenge and video on their blog. 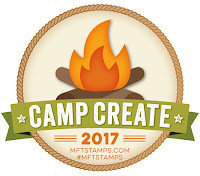 Details are listed below from the MFT blog. Watch today’s video and follow the Creative Challenge issued at the end of the video. Link your project below for your chance to win! 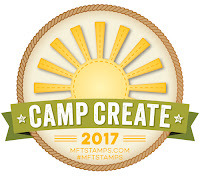 Add the badge below to your blog post to show you’ve earned it! To be eligible to win a $25 voucher: Participate in today’s craft and upload an image via InLinkz on today’s post. Winners will be chosen randomly from the InLinkz entries. To be eligible to win a $15 voucher: Subscribe to our MFTv channel on YouTube and comment on today’s video. Winners will be chosen randomly from comments on the YouTube video and announced Monday, June 26th. 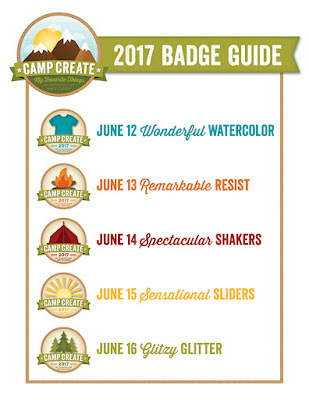 To be eligible to win the $150 Grand Prize: Earn all five badges for the week by participating in each craft presented this week (via the InLinkz on each blog post). One random winner will be chosen for the week! 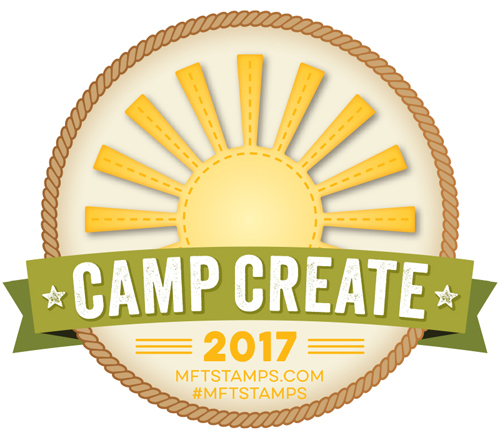 Deadline to comment and upload your images is Thursday, June 22nd at 10 PM EDT. All winners will be announced on Monday, June 26, so make sure to check back to see if you are a winner! 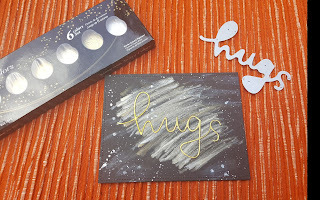 I used Zig Kuretake Gansi Tambi Starry watercolors to create the background and also on the hugs die cut from Concord & 9th. These watercolors are so much fun and so easy to use. 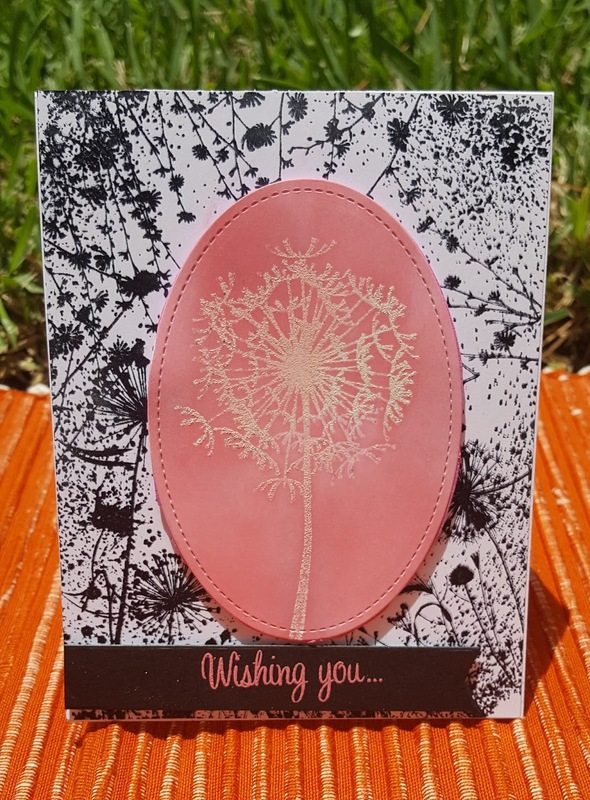 I heat embossed the dandelion using Ranger snowflake tinsel. 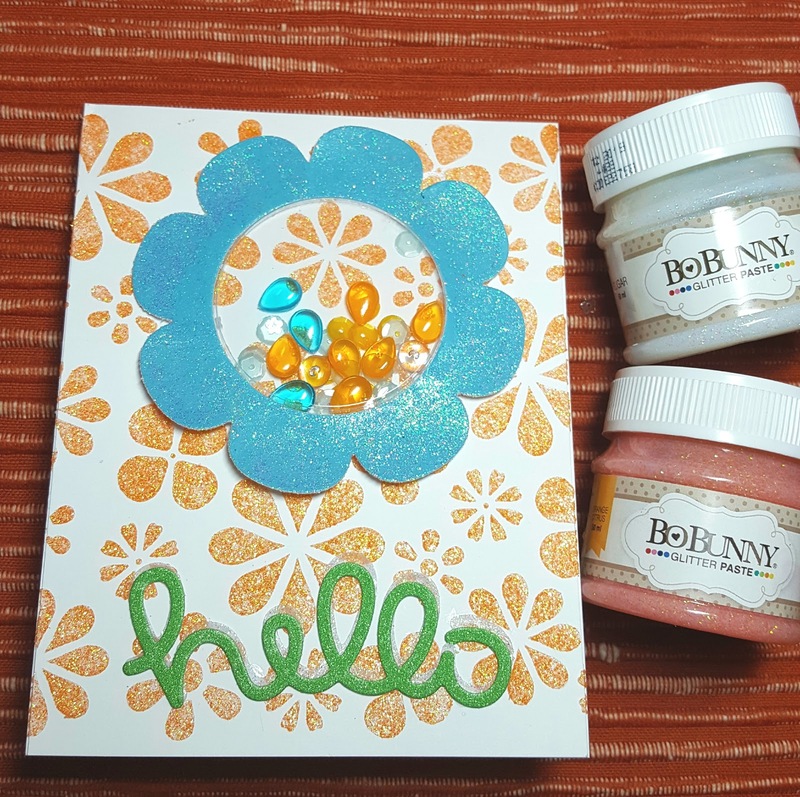 This embossing powder is an off white color with rainbow glitter flakes in it. I then used Distress Oxide worn lipstick for the resist effect. 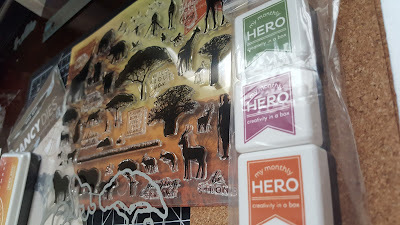 The background is a Hero Arts large cling stamp. I love the way pink pops when you add it to black backgrounds. 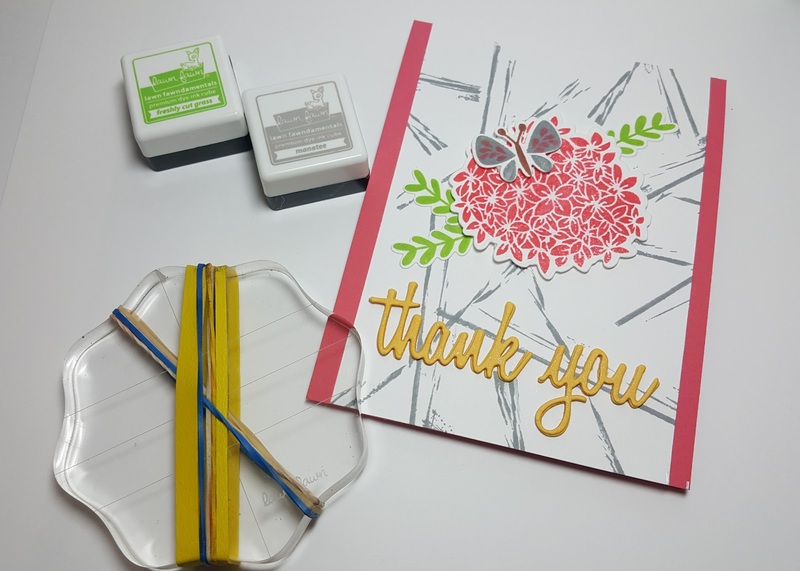 For today's challenge I created a shaker card using MFT Bold Stripes die along with Lawn Fawn Blooms stamp set. I also added a mix of Pretty Pink Posh sequence. 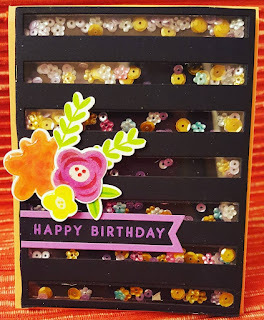 I added Happy Birthday sentiment using the MFT fishtail sentiment dies along with ranger purple embossing powder. 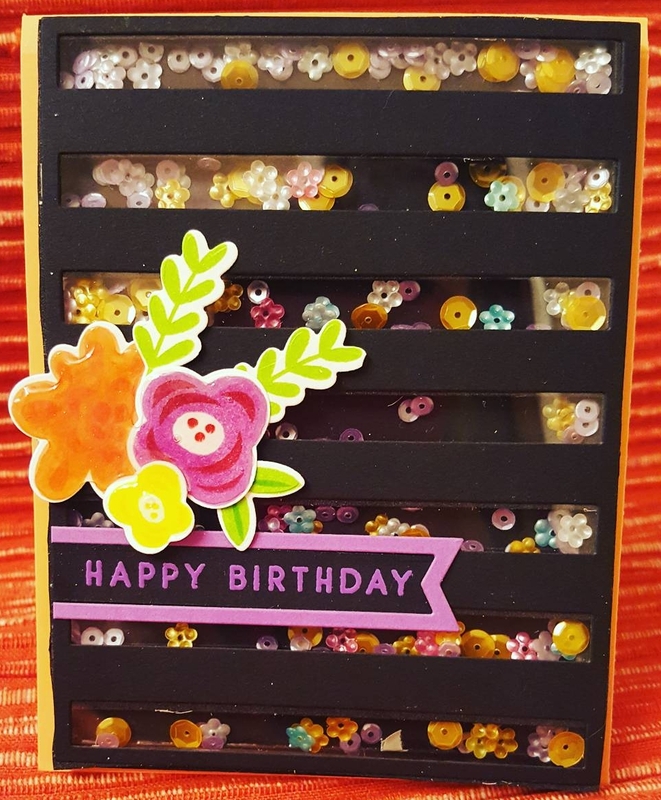 The card I created for today's challenge is a slider using the Lawn Fawn set Cruising Through Life. 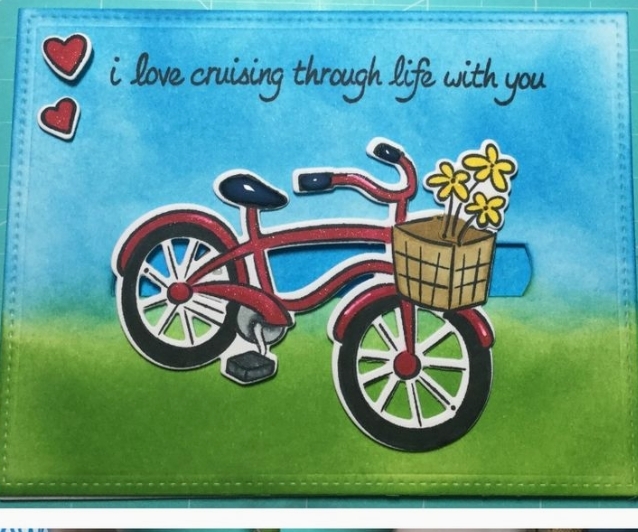 I used Distress ink to create the background and Spectrum Noir alcohol markers to color the bike and hearts. I used Lawn Fawn Slide on Over dies for the slider mechanism. Last Saturday my middle child graduated from high school. I can't believe I only have one left to go. Time truly does fly! 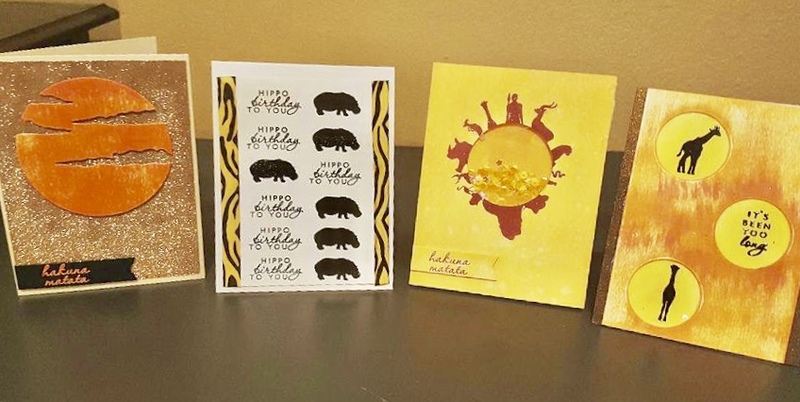 My son was blessed with gifts and cards from many family and friends which equates to Momma's reason to make cards. Yeah! His school colors are yellow and blue. I started by creating the background using Lawn Fawns Hats off to You stamp set. The graduation cap was the perfect size. 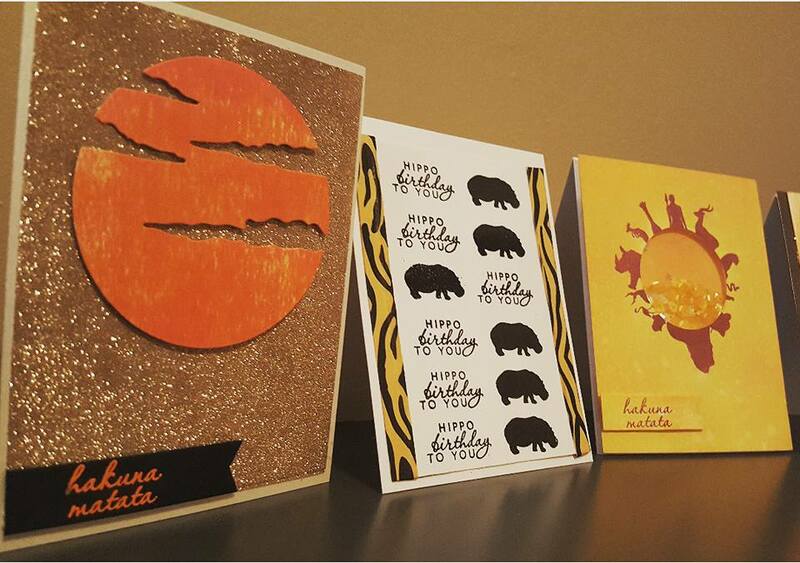 I created some backgrounds using Neenah Classic Crest Solar White 80 lb card stock. 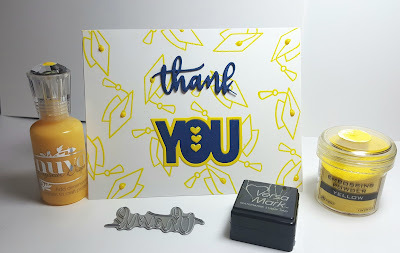 Heat embossing with yellow Ranger embossing powder. Next, I adhered the background to Neenah Classic Crest Solar White 110 card stock cut to A2 size. 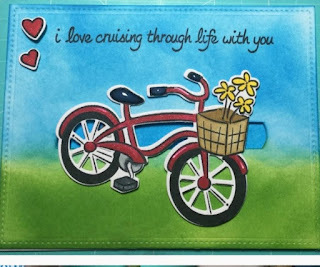 I chose to use the All About You dies from the Concord & 9th May release. 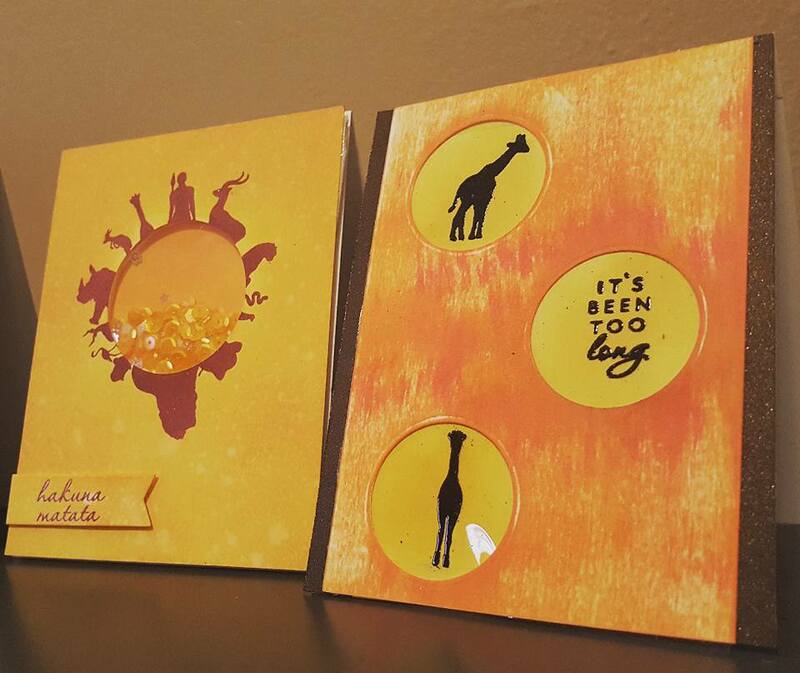 Love this release! At the time of this post they still have the complete sets available here to purchase. The June release is fabulous also. I will definitely have several post using this release. Back to this card.. the "You"die from the set cuts the outline and center separate along with an area in the center of the "O" for three hearts to sit in the center. The size was perfect for the cards. I changed the outline colors depending on the color of the background. For the blue I used Lawn Fawn blue jay cardstock and the yellow was a sheet of paper I had in my stash. The "thanks" die is beautiful and quit delicate which balanced out the bold "you" perfectly. 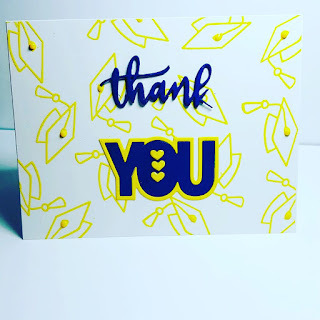 I decided to create dimension with the thanks by cutting a piece of adhesive fun foam to put behind it. I also added Stick It Adhesive to the other side of the foam. If you have not used Stick It Adhesive you are defiantly missing out. It is inexpensive and last forever. 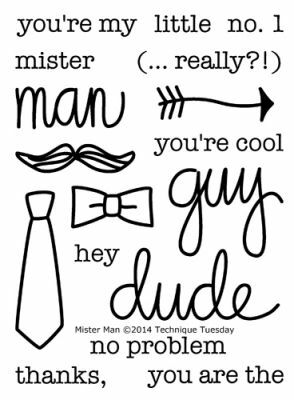 Anything that creates a sticker has to be great! I have found the easiest way to add foam to delicate die cuts is to pick it up and manipulate it in your hands. I have tried laying it on my craft table and I struggle. Any other suggestions of techniques that work for you please leave a comment, ideas are ALWAYS welcome! Once I got the "thanks" and "you" added I used Ranger multi medium matte to adhere the hearts. 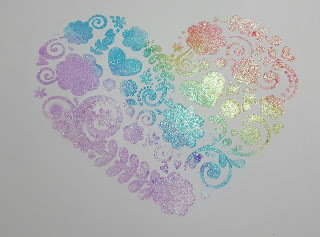 After giving it a glitter bath with Wink of Stella I added glossy accents to the tiny hearts. I loved the card as is, but decided it needed something...Nuvo crystal drops in dandelion yellow to the rescue! I added small drops to the tops of the caps and now it was complete. Son approved as well! Although I live in Texas and my father now lives in Kansas we are originally from West Virginia. We are all forever blue and gold Mountaineers. 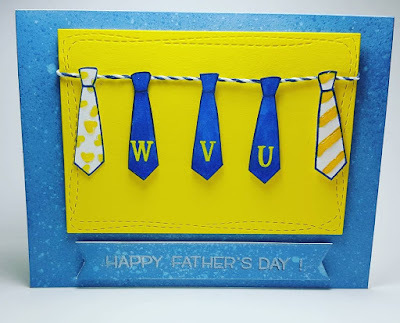 My father is a huge fan so the idea of creating a WVU Father's Day card for him sounded like so much fun! I ordered an adorable stamp set and die from Technique Tuesday. If you haven't checked out this company you should! They are awesome! They have so many great "out of the box" stamp sets and dies. I will include a link to their site at the bottom of this post. For this card I used the Mister Man stamp set from TT and the sentiment is from Lawn Fawn Happy Happy Happy. 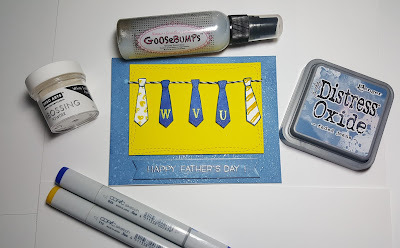 I began by stamping several ties out in Lawn Fawn Blue Jay ink. After coloring the ties with Copics B26 and B28 I stamped the WVU letters on each tie in Versamark ink with my Misti so I could heat emboss the letters using Ranger yellow embossing powder. I am a lazy crafter. 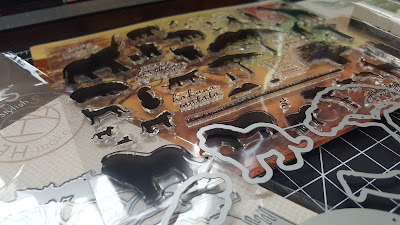 I will always spend the extra money to buy coordinating dies so I do not have to fussy cut, however this set did not have matching dies so I had to fussy cut the tie. (which really was quite simple). I also stamped small hearts using Hero Arts dandelion ink on one tie and stripes with Copic Y15. 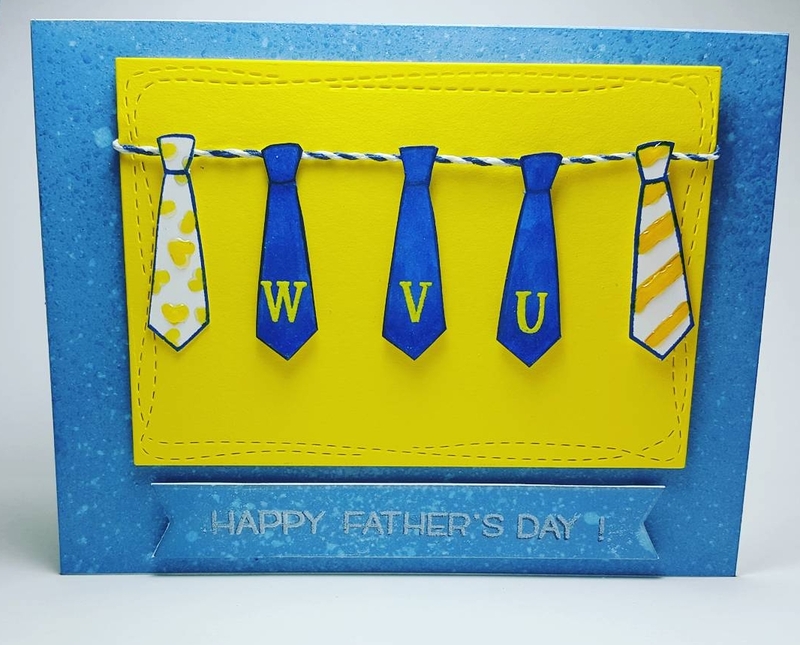 I wanted ties on either side of the WVU to give the card some variety and lighten it up a bit. 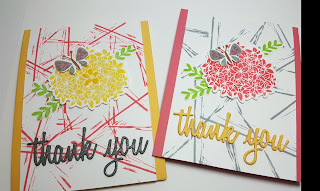 For the background I used the 2nd smallest Simon Says Stamp Wonky Rectangle dies (love, love!) out of yellow paper from my stash for the layered background. Using Lawn Fawn Blue Jay cord I "hung" the 5 ties using glue dots. On a Neenah 110 lb card base cut to A2 size I applied with a blending tool Distress Oxide faded jeans. After I spritzed the panel with water I felt it still needed something so I used Goosebumps Shimmer Texture Spray. 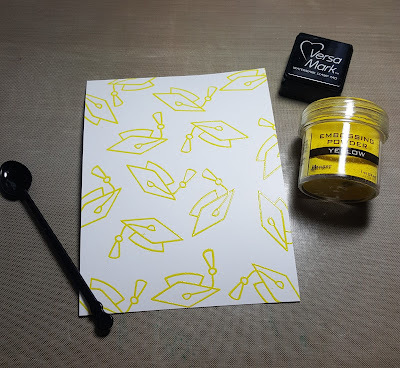 I actually tried this texture spray on another color of Distress Oxide ink and it changed the color of the ink which was very cool, however not the effect I was looking for. Faded jeans did not change color with the spray, just shine and texture. The sentiment came about by a mistake. I make many and have many changes when creating cards. That's part of the fun in my opinion. I messed up the first card base by getting ink on the back of it, so I cut it off with the intentions of attaching it to another base, however I decided to create another one. 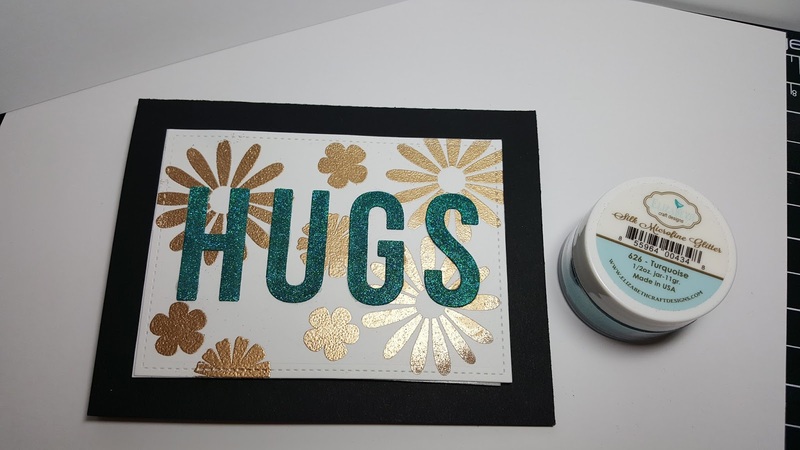 The one shown on the card is actually the second background with Distress Oxide that I created and the sentiment is the first. 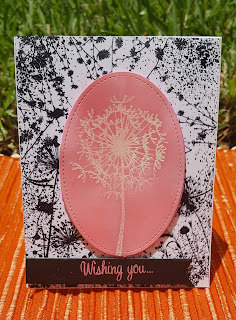 After stamping out the sentiment in Lawn Fawn Jet Black Ink and cutting it out using My Favorite Things Stitched Fishtail Sentiment Strips I wanted it to stand out a little more, to achieve this I re-stamped it with Versamark ink and used Hero Arts White Satin Embossing Powder This stuff is AMAZING! I saw a video where Jennifer McGuire used it and I had to have it. 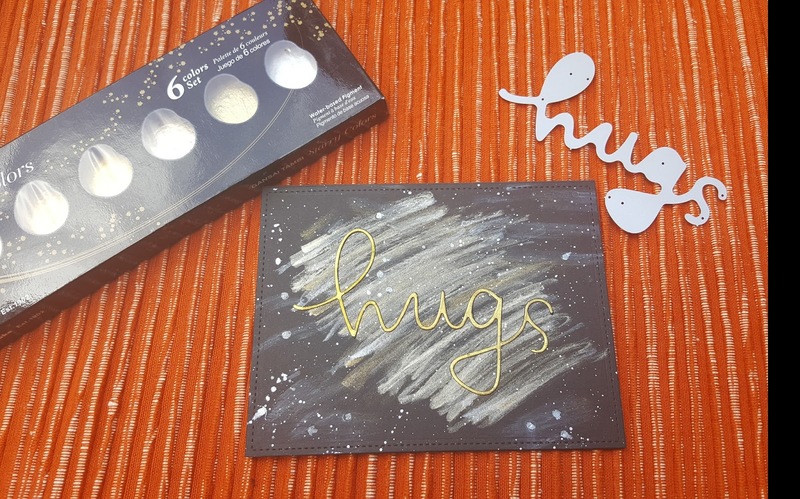 It creates a metallic/ pearl look that picks up the color behind the powder. You can see in the pictures it picked up the blue jean color with a metallic look. I used 3M double sided foam tape to pop it all up, added Wink of Stella to the middle ties and glossy accents to the end ties and it was complete. I know my Dad will love it as much as I loved creating it!